Hey Bill, we have all heard lots about Ardbeg Galileo, would you be able to clarify exactly what it is and some of the thought behind it? Well I guess I can confirm this all now since it’s only a few days to go until the official launch. It all stems from lots of experimental work we have done and continue to do… (interrupted by Hamish Torrie, former Ardbeg Brand Director, pulling faces outside the room to get Bill’s attention) Erm… we carry out lots of experiments here at Ardbeg and we find that, rather than finishing, if we fill lots of new spirit into different types of casks and then find them a bit to intense we can blend them back with classic Ardbeg from ex-bourbon barrels. That’s what worked with Corryvreckan and Alligator, so this is the latest one like that. This was some whisky I put into Marsala casks. I didn’t have any particular end point in line, I just always enjoyed Marsala wine and compared to some of the classic fortified Spanish wines – the sherries and what-not – it had more of an oxidative character, a bit more complexity to it and so I thought I would wait and see what we get. We have vatted that together with other Ardbeg ex-bourbon casks also from 1999. You very much pick up, noticeably, the Marsala character. So what was the Marsala cask like alone? It was a bit syrupy and a bit too treacly. This happens a lot when we experiment with Glenmorangie that has been wholly matured in fortified wine casks; it just completely kills it. Obviously, Ardbeg can stand up to it quite a bit more, but I think by blending it with classic Ardbeg it gives it a much more rounded, polished product. What was your reason behind wanting a wine cask for Ardbeg Galileo? Was Marsala the only wine on the cards? Well with wine casks in general, whether finishes or full maturation, there can be some very good ones but also some that don’t do justice to how the wine finish can be done. There are many, many types that we have on trial. For Ardbeg Galileo I did want to try Marsala, primarily because I like the wine myself and I have never see it being used anywhere else in the whisky industry and so I tucked it away somewhere. Obviously its a little bit to my own chagrin when I see lots of other companies doing something with these cask types that I may have started long before them but maybe had not released yet. Was there any casks that you tried that maybe didn’t come out as hoped, or maybe exceeded expectations? With Ardbeg there is not really any that I haven’t been able to do something with so far. But with Glenmorangie I tried some Royal Tokaji casks, even talking about that greatly upsets me! I had them before anyone else in the industry did but I left the Glenmorangie whisky in them for far to long and it was too woody and way over the top. There have been one or two other underwhelming ones just blended away, but I do try to think it through carefully and have a pretty high hit rate. Hopefully that will continue! Looking at your experimental nature and getting away from wine casks, is there anything else that you have been experimenting with? Either successfully or unsuccessfully? Well, I was looking at my 2012 wood purchase order and I have bought so many more experimental casks this year and a lot are going to Ardbeg. But anyway, I can’t say much about those now and it may be some time before we see any results from these. I did try using a different type of wood, Brazillian Cherry Wood to be specific. No-one else was doing this, so it was quite innovative and interestingly the Scotch Whisky Association got wind of this fairly early and stopped me doing anything with it. Subsequent to that they re-wrote the guidelines to make it more clear. It used to say matured in Scotland, in oak casks for the minimum of three years. My whisky was matured in Scotland in oak casks for ten years and THEN I finished it in the Brazillian wood. That sounded fine to me, but they were having none of it. Anyway, the whisky absolutely sucked and tasted like a mixture of marzipan and furniture polish. So, back to the Ardbeg Galileo. Previous Ardbeg releases such as Alligator, Rollercoaster and Supernova were non-age statements. Was there a reason behind putting an age statement (1999) on Galileo? We decided that when we first started building up the Ardbeg brand, we wanted to focus on the quality of the product itself and unlike so many other whiskies out there it didn’t necessarily need an age statement on it. However, with Galileo we knew the Ardbeg brand team are magnificent in terms of how creative they are and Space 1999… we liked the sound of that! That is why we are more overt with an age statement on this one. So will this signal a move back to age statements for Ardbeg? Well this whisky is fully twelve years old, for what that’s worth, but no, we would only put an age statement on if there is a reason for it. Like for the ten year as it is our core product, or if there is a particularly interesting vintage. Ardbeg Galileo is bottled at 49% ABV – has it been watered down to this or is this natural cask strength? If it has been watered down, why not to a ‘typical’ bottling strength of 40, 43 or even 46% ABV? Two reasons for this. One, we liked this strength, it was an unusual strength to bottle at and so fits in with the Ardbeg brand positioning. In practical terms, it was vatted at 50 point something and you always have to build in a safety factor for the labelling so we decided to take it down a wee bit. Say it was 50.6% ABV, which I think it was, if we had printed that on the label, by the time we had taken it from the vat and bottled it, the strength would have dropped and so we had to be careful with it. Where do you think Ardbeg’s future lies? Will it remain a distillery that releases small batches of interesting whisky? Or once the mature stocks are there in large enough quantities, will we see a range of whiskies with different age statements to make up part of a core range, with unusual editions coming out sporadically on top of that? I can safely say that the core range will continue to have Ardbeg 10 and Uigeadail in it, they display both the best of bourbon and sherry cask Ardbeg. Corryvreckan is likely to continue, I wouldn’t put it any stronger than that, it is not always easy to get the cask. There will always be an annual limited release and we may well add to the core range going forward, I have some ideas for them but we have to wait and see. Do you get involved in the naming of the whisky (Galileo, Alligator etc.)? Yes! Myself, Hamish and Allan can have a lot of fun with that. The first one we named was Uigeadail, I had just been up to the loch and I thought it was nice to do something like that. Alligator was a bit of a no-brainer, I was trying to engage Hamish Torrie to go for something along the lines of an Ardbeg Ghia. Now you guys, may be a bit young for this but back in the good old 60′s and 70′s, the top of the Ford motor car range was always called a Ford -whatever the model- Ghia, basically the base model with some extra whistles and bells on it. I wanted to make something very Ardbeg but with a little bit more! He didn’t seem very interested until I mentioned the heavily charred casks and described it as ‘a real alligator char’, then he finally woke up and took an interest. So, in case you think there is any great strategic planning that goes into the names, it tends to just be in casual conversations like that. When would you say is the ideal setting/occasion/time of day to drink Galileo and why? Most of the Ardbegs I would say are evening whiskies, not necessarily breakfast whiskies in a way that you could maybe describe Glenmorangie Original. My perfect setting and occasion for Galileo would therefore be on a reasonably warm summers evening, not scorchingly hot as that hardly happens in Scotland of course, while watching a magnificent reddish sunset go down. I have fortunately been able to do this in the last few weeks as my house looks over the south of Edinburgh and the Forth. The view of the sunset and the lights of Edinburgh beginning to twinkle is perfect for a measure, or three, of Ardbeg Galileo. The reason that I say this, is that compared to heavier more intense Ardbeg like Alligator or Corryvreckan, Galileo has a lot of these big summary fruit type flavours and so it is nice to drink like that. 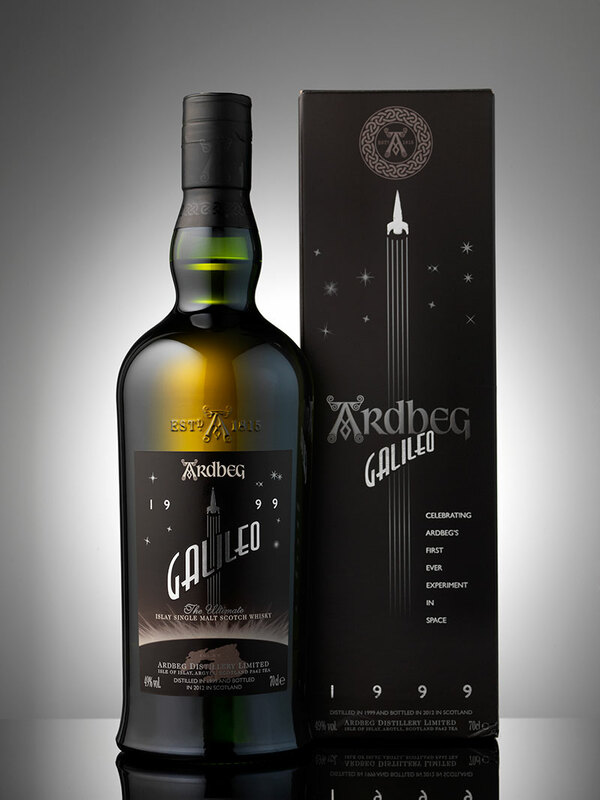 Finally, would you mind sharing some of your tasting notes on Ardbeg Galileo? When I first tasted it under development I described it as a cornucopia of tropical fruits, that was the first thing that came through to me. It has a lovely, deep amber colour. This as it is an Older Ardbeg and certainly the whisky from the marsala cask had a deep Mahogany colour which added to it. You get this kind of coal tar, sooty type note. Hints of Toffee, I think even said Butterkist popcorn. Lots of tropical hints like very ripe banana – banana almost going black, lychee and mango. It has a very, oily texture – of course its un-chill filtered – and you get hints of fudge from the Bourbon barrels. Its like there is some sort of smoked fruit, if you imagine taking bananas and apricots and then pouring cream over it, that is the kind of sensation you get. Finally you get this sootiness and spiciness in the after taste. I am hoping this is tickling your fancy a little bit! There you have it guys! Ardbeg Galileo from the man who knows more about the whisky than anyone else. We here at Edinburgh Whisky Blog would like to thank Bill for taking the time to talk to us and it was an absolute pleasure to chat to him. I hope that this has got you guys as excited as I am to try it, some of you may even be tucking into some Ardbeg Galileo as you read this – lucky folks! Stay tuned for Part 2 of our Galileo posts on Monday. I will be posting up my own tasting notes from Ardbeg Galileo and we also have another special surprise to share with you! Aren’t we nice! Feel free to leave any comments on Ardbeg Galileo below or if you have any comments on the interview with Bill I am sure he would appreciate being able to read them. Join us on Monday for part two and more Ardbeg style treats! This entry was posted	on Saturday, September 1st, 2012 at 6:36 am	and is filed under Featured, News. You can follow any responses to this entry through the RSS 2.0 feed. Responses are currently closed, but you can trackback from your own site.